Breathe Right nasal strips gently open nasal passages so you can breathe through your nose and close your mouth, reducing snoring. Athletes also use nasal strips to improve their breathing during a workout. 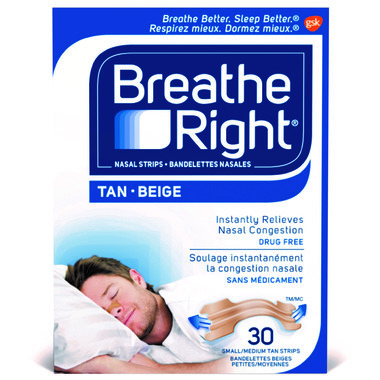 Breathe Right nasal strips are ideal for every kind of aerobic exercise. These did somewhat relieve my stuffiness overnight due to a cold. Unfortunately, I shower at night, not in the morning. So removing it in the shower wasn't happening. I tried soaking it in a wet cloth to remove it, but it hurt, and my nose is still a bit sore at the end of the day. These aren't the sexiest things to bed but when you're sick or can't breath properly during the night, they are a life saver. I wear these when I'm really sick and can't get a good night sleep due to congestion.